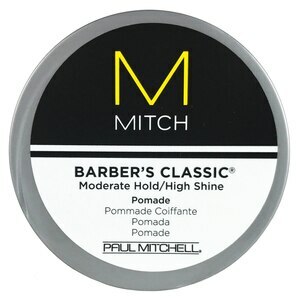 Weightlessly style your hair without the fuss with Paul Mitchell Mitch Barber's Classic high shine pomade. This pomade will amplify your style with added shine. Ingredients: Water, Bis-Diglyceryl Polyacyladipate 2, PEG 25 Hydrogenated Castor Oil, Oleth 10, Oleth 20, C12 15 Alkyl Benzoate, Diisopropyl Dimer Dilinoleate, Glycerin, PVP, Propylene Glycol, Caprylhydroxamic Acid, Phenoxyethanol, Methylpropanediol, Ext. Violet 2 (CI 60730), Fragrance, Benzyl Benzoate, Butylphenyl Methylpropional, Citral, Citronellol, Geraniol, Limonene, Linalool.